GOP leaders are facing a difficult task in trying to build united support among the Republican rank-and-file for a strategy on the government shutdown. In the Pew Research Center’s most recent survey, conducted Oct. 3-6, most Republicans and Republican leaners who agree with the Tea Party (64%) approved of how GOP leaders were handling negotiations on the government shutdown. Most other Republicans (61%) did not. A month ago, it was Tea Party Republicans who were unhappy with GOP leaders. In our September poll, just 27% approved of the overall job performance of Republican congressional leaders; 71% disapproved. 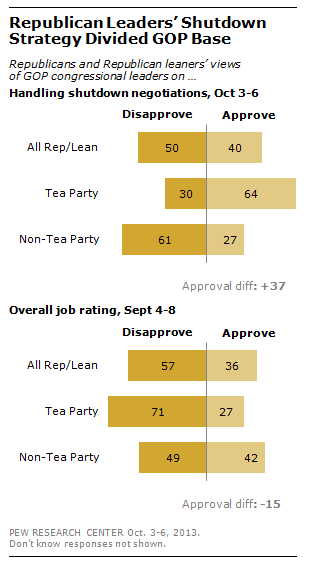 At that time, non-Tea Party Republicans were more positive, with 42% approving and 49% disapproving. Among all Republicans and Republican-leaning independents, 35% agree with the Tea Party while 61% either disagree or have no opinion either way.